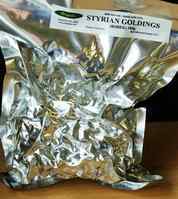 3.8% Styrian Goldings hop for use in home brewed all grain beers - Vacuum packed for longer shelf life. A Fuggles like hop that is often used in Europan Lagers and less malty, golden coloured ales. Vacuum packed for longer shelf life. Styrian Goldings is well known throughout the world and, whilst identical to Fuggles in many respects, it has a "perfume like" character best suited to European Lagers and less malty, Golden coloured ales. It is grown in Slovenia and has a typical Alpha Acid content of 2-5% depending on the variety, so you may need to adjust your recipe in order to match the calculated EBU levels.